Allows you to play most Gameboy/Gameboy Colour games including Pokemon (no RTC support), Zelda, Wario Land, LSDJ (only 1 save), etc. A downside to having 64MB flash is that it will take approximately 50 minutes to write to all of it, it isn’t very fast. At this time, this flash cart can only be used with our GBxCart RW flasher if you wish to write more than 8MB to it or want to keep your save slots in-tact. This cart works on the GBC, GBA, GBA SP and the Game Boy Player but due to the high current draw on v1.0 (120-140mA), it isn’t recommended for the GBA SP. Games that require more than 32KB of RAM won’t work. Doesn’t work on the original Gameboy or the Gameboy Pocket. 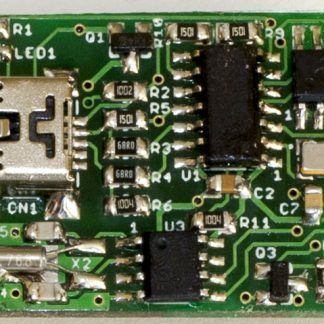 A new version is in the works to make it compatible and low power around 25mA. 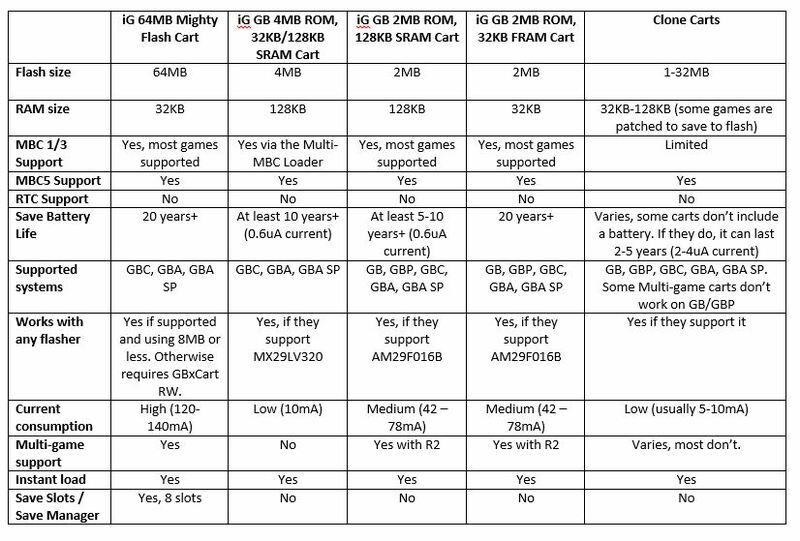 Check out the cart comparison image to see how each cart compares to each other and the clone carts. Comes in a generic clear or grey Gameboy cartridge with our label. Each unit is assembled in house and is tested on a Gameboy Advance. You can supply the ROM file for us to flash the cart if you like, it will be tested for 20-30 seconds to ensure it works. We usually ship within 2-3 business days and the usual delivery time is 2 to 4 weeks. This product can be back ordered, you’ll be provided with an ETA when more stock is expected, usually it’s 2-3 weeks. MBC: MBC5 by default. Use loader to allow for MBC1/3 games. 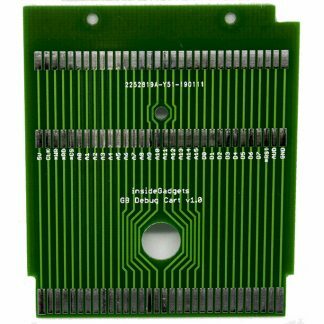 The PCB finish is ENIG, Gold fingers (on the edge connector) with a 45 degree bevel to give the maximum life for insertion/removal of the cartridge. 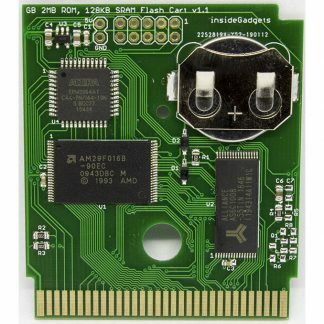 This flash cart will draw 120-140mA more current compared to a regular cartridge due to the CPLD so you will see a decrease in battery life of at least half. New low power version coming soon, around 25mA. 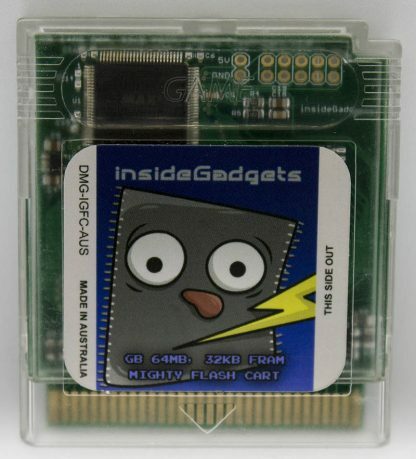 When you place an order, if you would like the flash cart to be programmed with a ROM, you need to supply it to us via email (you can reply to your order notification). It will be tested for 20-30 seconds on a Gameboy Advance to ensure it works, if it doesn’t work, we’ll contact you. 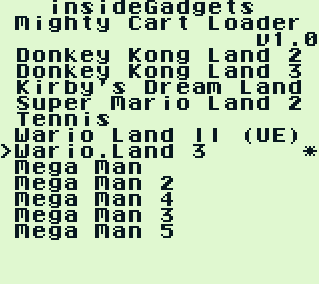 If you don’t specify a ROM, it will be loaded with the LSDJ Demo. Open up the insideGadgets 64MB Mighty Flash Cart Multi-Game Maker.exe file. You can simply drag and drop your ROM files to it and move items up or down or remove them. 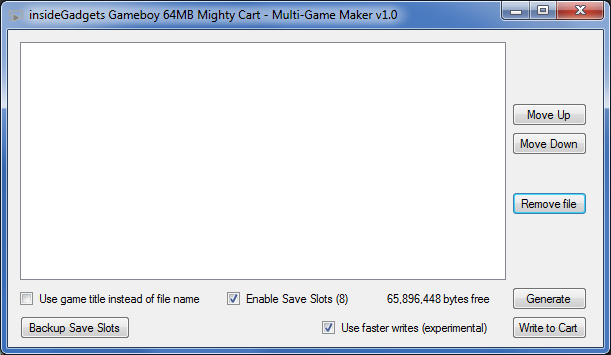 By default the save slot option is enabled, disabling it will allow you to have 1MB more space. The “Use faster writes” can sometimes be hit or miss but you will know within 10-20 seconds of no progress, please power cycle the flasher and try again. You can select the “Backup Save Slots” option to backup your save slots to a folder with the current date/time and each save slot will have the save name you gave it. Once you have added the files you wish, press generate and a pop-up window will appear briefly and it will generate an output.gb file. After that, if you have GBxCart RW plugged in, you can press Write to Cart and it will flash the output.gb file to your flash cart. If save slots are enabled, it won’t overwrite the save slot data on the cart. Once you boot your Gameboy, you can use the up/down arrow to scroll through the list or left/right to jump by 10 places. Press A to launch the game – the Gameboy will restart and the game will be loaded. After you play your first game and power off the system, when you power it back on, you will automatically jump to the last game you played which has an asterisk next to it. This is done so it’s less likely for you to load a different game by accident and lose your save data if you haven’t backed it up. 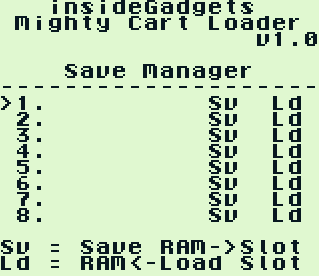 If you enabled save slots, you will have access 8 save slots by pressing the Start button at the loader screen. You can give the save slot a name by pressing A when selecting a slot number and then using the up/down arrow keys to cycle through characters. Press B to exit if you want to give it a short name. The save name will only be saved when you save the RAM to the slot. To save the RAM to the slot, select the “Sv” option, press A and then press Select to confirm. It will take about 30 seconds to save. To load the slot into the RAM, select the “Ld” option, press A and then press Select to confirm. It will take about 30 seconds to load.